There was no one quite like Jean Gallup. A remarkable woman, Jean’s beautiful smile and gracious heart could light up a room. A true blessing in the lives around her, Jean’s positive nature and loving heart added much to those who came to know and love her. Born and raised in the lakeshore city of Muskegon, Michigan, Jean Marie was a welcome addition in the lives of her parents, Arthur and Dorothy (Hower) Sundell on August 24, 1925. A time of rapid growth in the U.S., it was they heyday of the infamous Roaring Twenties and the nation’s can-do spirit was alive and well. 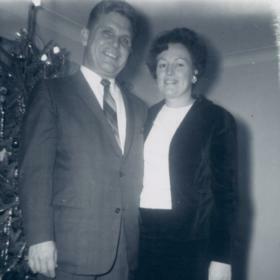 Jean joined her older brother, Carl and to support their family, Jean’s father worked as an electrician and her mother added to their income as a talented seamstress. The Sundell’s made their home on Hudson Street in Muskegon where numerous memories were enjoyed and shared. Jean attended Glenside Elementary School and during her youth she formed close and lifelong friendships, especially with Mary (Panici) Swanson with whom Jean had been friends with for over 75 years. While attending Glenside, one of Jean’s teachers made her stay after school to work on her handwriting. It truly paid off because Jean had the most beautiful handwriting. As a youngster, Jean’s parents bought her a Wurlitzer piano. 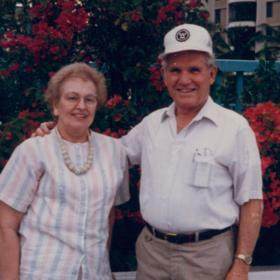 Jean and her family enjoyed travels to Washington, D.C., Milwaukee, Wisconsin, the Soo Locks in Sault Ste. Marie, Michigan and attended the 1933 World’s Fair in Chicago. Raised in faith, Jean was a lifelong member of Samuel Lutheran Church where she was confirmed and where every Christmas was celebrated Scandinavian style on Christmas Eve. Although she never acquired a taste for it, Jean in later years made the traditional dish of Lutefisk for the elders at church. Even though Jean and her family faired well during the years of the Great Depression, times were indeed hard. Jean recalled how the dried whitefish Lutefisk was set outside the store and propped up like a board and was certain the local dogs relieved themselves on it for it had an awful smell! Dogs were always a part of Jean’s growing up years and beyond. Among other dogs, they mainly enjoyed having Manchester terriers. 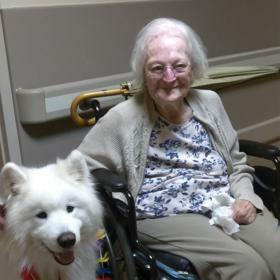 As a young child Jean had a big white dog and later while residing at the nursing home, dogs were brought in to visit the patients. This clearly struck a cord with Jean as she was always overjoyed to see them. When she had a family of her own, a pet Schnauzer named Max in the early 1970s became Jean’s dog once the kids left home. As young girls, Jean and her friends had a Quija board and it frightened them so they did away with it in a field. Jean was an outgoing and fun-loving girl full of laughter and even a little mischief! 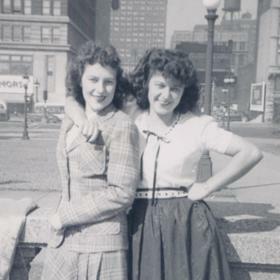 She and her girlfriends, Mary and Shirley shared many adventures as young women including a memorable trip to Chicago when they were 18. Through the years they fondly recalled their trip for which their parents were none too happy but thankful they made it home safely, even though they never mentioned anything about having lost a purse and a shoe! Sunday afternoons often found Jean and Mary taking Jean’s parents car out for a spin while they napped. The two girls marveled how they could return the car to the precise spot each time and to Jean’s knowledge, her parents never knew. And of course, the beach always provided the girls with much to do. Jean graduated from Muskegon High School with the Class of 1943 and soon began working for the Brunswick Corporation as a stenographer. With World War II well underway, Jean and her friends wrote letters and sent photos to the GI’s to cheer them up. It was during this time when Jean met the man of her dreams, Gerald “Gerry” Gallup. They met at a local dance, began dating and on April 16, 1948 they were happily married. To their union they were blessed with four children. David was born in 1949, and Patricia followed in 1951. In 1957 Susan came along, and Thomas completed their family in 1960. They built a home in Norton Shores in 1952 where together they raised their family with faith, love, and devotion. Jean made a good home for Gerry and the kids as a homemaker, and once Sue was in college, Jean began working for Dr. Rector as a typist. She was an excellent cook and baker, especially at Christmastime baking cookies and breads. When in Arizona, Jean passed her love for baking to Sue and her daughters as they often baked together. A very loving and attentive mother, Jean was certain to be home when the kids returned from school. She always made sure they had every opportunity to be involved in band, dance and school activities where she was involved at times, as well. Great times were always enjoyed on family vacations at Glen Lake. They often booked their favorite cottage the same week as friends and together the kids could swim and play while the parents played cards at night. Friday nights were always reserved for family TV night in their home complete with popcorn and pop. They also enjoyed many beach breakfasts along Lake Michigan to celebrate special occasions and out-of-town visitors. Jean enjoyed a variety of activities. She was on a bowling league, golfed and played Cribbage. Always one for a good card game, she played Blackjack at the casinos, and for over 50 years she and Gerry were part of a Pinochle club. When Jean was with Brunswick she received a pool cue from professional pool player, Willie Mosconi who was in town promoting Brunswick pool products. It was in the 1940s, and part of his tour was to promote and encourage women to play pool. Jean learned to play pool during this time and went on to play in a league with friends in Muskegon and later when she and Gerry began wintering in Phoenix, Arizona. Along with church and as members of the Vikings, Jean enjoyed the friendships of many including the Swanson’s, Ozios and friends from their Pinochle Club. Jean’s grandchildren brought her the greatest joy. When Gerry retired in his sixties they began spending the winters in Arizona which allowed them to see their granddaughters. Jean loved teaching them to sew and knit in addition to baking. They made many doll clothes, costumes, a junior bridesmaid dress for Katie, and a Renaissance dress for Lindsey. 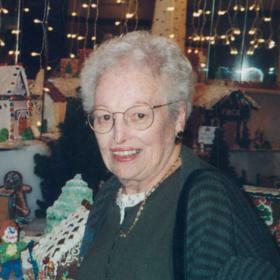 She taught them the game of cribbage and enjoyed many sleepovers together all while enjoying putt-putt golf, shuffleboard, swimming, attending their activities and enjoying memorable Christmas holidays. Birds brought certain joy to Jean’s heart. One time she and her family rescued a blue jay with a broken wing and after nursing it back to health they were able to release it back into the wild. Jean’s love of birds included bird feeders and birdbaths in her backyard where she loved watching them come and go. In fact, Jean had a love for all animals. Just one example of her tender and loving heart, Jean gave unconditionally to everything she loved and adored. 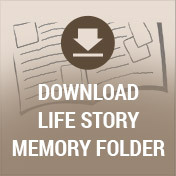 Suffering from dementia, Jean became a resident of Hillcrest Nursing Center where she resided for over five years. Her family continues to appreciate the compassionate care Jean received there. Penny Sorenson and her colleague, Marilyn brought much joy to Jean, particularly when they brought their therapy dogs, Auggie, Elvie and Wicket on their weekly visits. Whenever Jean saw the pups she just beamed. No one will ever forget Jean’s beautiful smile. She was a sweet, loving woman whose kind heart knew no bounds. Jean foremost adored her family. She expelled warmth and kindness to all, and for these things and so much more, she will be dearly missed. Mrs. Jean Marie Gallup, age 92, passed away Sunday, November 12, 2017. SURVIVORS: Son, Thomas Gallup of Muskegon; daughter, Susan (Barton) Godfrey of AZ; grandchildren, Lindsey & Katie Hoyle; great-granddaughter, Adilyn Jones; brother-in-law, Robert (Terry) Gallup; many nieces & nephews. She was preceded in death by her husband, Gerald in 2000; son, David in 1961, and daughter, Patricia Gallup in 2014. SERVICE: Monday, December 18, 2017, 11:00 am with visitation one hour prior to the services at Samuel Lutheran Church with Rev. Chris Anderson officiating. MEMORIAL: Samuel Lutheran Church or Harbor Hospice Foundation. To share a favorite memory or photo of Jean and to sign her online guest book, please visit clockfuneralhome.com.